Born: March 26, 1910 in Cataumet Ma. Died: November 18, 2001 in Cataumet Ma. 1. 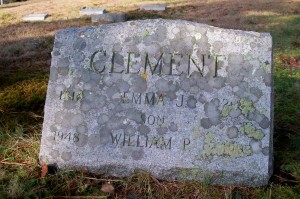 William P. Clement; (November 13, 1948 – June 19, 1992); William was unmarried & is buried with his mother in Cataumet Cemetery.